Your Dentist in Oklahoma City Says Don’t Waste Your Dental Insurance! The end of the year is almost here, and the holiday season is in full effect. More than likely, you’re busy running errands, making purchases and decorating for a holiday gathering. In the midst of tying up any loose ends, your dentist in Oklahoma City says don’t forget about your oral health. 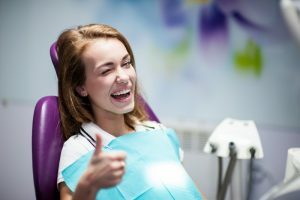 Find out why taking advantage of your dental insurance is a time-sensitive matter, and also learn what you can do to maximize it! On average, a person spends $350 annually on dental insurance premiums. That coverage will provide a yearly maximum of between $1,000 and $1,500. While nearly 80% of the American population have some form of dental insurance, the unfortunate reality is that many of them will let their coverage go to waste. In fact, one study shows that of those insured, less than 3% will maximize their coverage by the end of the year. That means they are leaving valuable care and money on the table! Preventive Care – Basic dental checkups, teeth cleaning and X-rays are generally considered as preventive care. Because they save you and your insurance company money in the long-term, these visits are highly encouraged. Therefore, 80 to 100% of the costs are usually covered by your dental insurance. Basic Care – Restoration dentistry procedures like fillings, dental crowns or dentures are typically classified as basic care. Your dental insurance will generally cover 50 to 80% of the costs. Major Care – For services like orthodontic treatment, dental sedation or custom oral appliances, your benefits will usually pay for 20 to 70% of the related fees. Getting the Value You Deserve! As the above outline shows, the greatest value is found with maintaining preventive care visits. These semi-annual visits save you money immediately and in the long-term. Additionally, they’ll save you time and prevent unnecessary suffering. That’s because your cosmetic dentist in Oklahoma City will be able to identify any developing issues before they can fully manifest. Thus, you can focus more of your efforts on maintaining your oral wellness instead of trying to correct problems that have been lingering. For most insurance companies, benefits renew at the start of the new year, so to utilize your current coverage, it’s important to contact your dentist in OKC to schedule a preventive care visit. With the help of your local expert, you’ll enter the new year with a beautiful and healthy smile! For the past 25 years, Dr. Joe Isaacson has been providing the utmost in dental care to his patients. A graduate of the University of Oklahoma College of Dentistry, he has had an award-winning career, as he has been rated #1 dentist by Doctoroogle.com and has received several other rewards for excellence. Dr. Isaacson provides top-notch care at his private practice, and he can be reached for more information through his website.